I’m enjoying putting together some fun and festive Easter crafts. 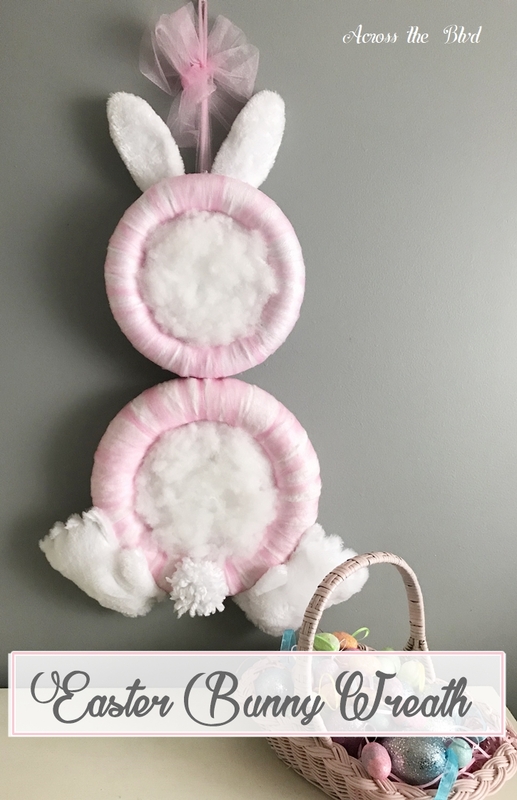 This Bunny Wreath for Easter is easy to make and is made using inexpensive items, keeping the cost low. That’s always a bonus for seasonal decor crafts. To make this I deconstructed an older project and reused bits and pieces of that along with a few additional items. I like that he’s viewed from behind as if he’s hopping on down the bunny trail! 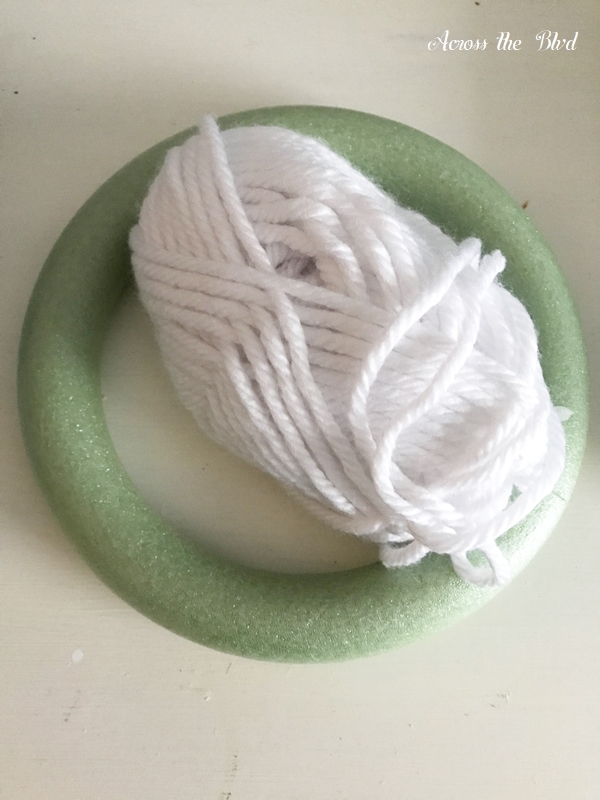 While I was shopping for items for our monthly dollar store craft challenge, I bought two of these small wreath forms. 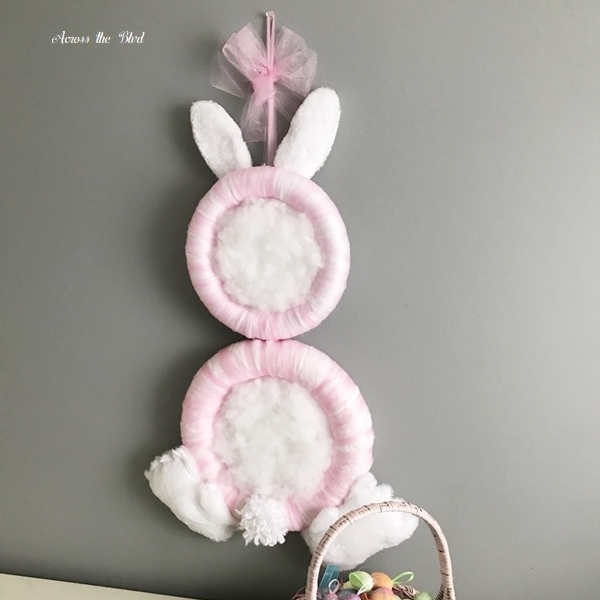 I used one for my Bunny Patch dollar store craft and the other was the perfect size for the bunny head for this project. I had most of the other items on hand. I think bags of Poly-Fil are bottomless! I’ve had this one for a couple years and I’ve made various projects with it, but it’s still practically full. 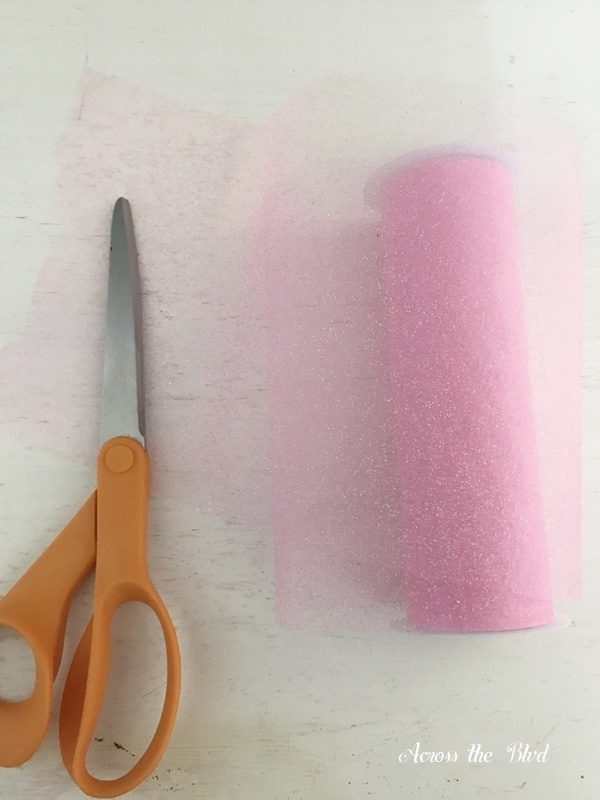 I purchased pink tulle at the Dollar Tree last year and I’m still using the same roll of it. 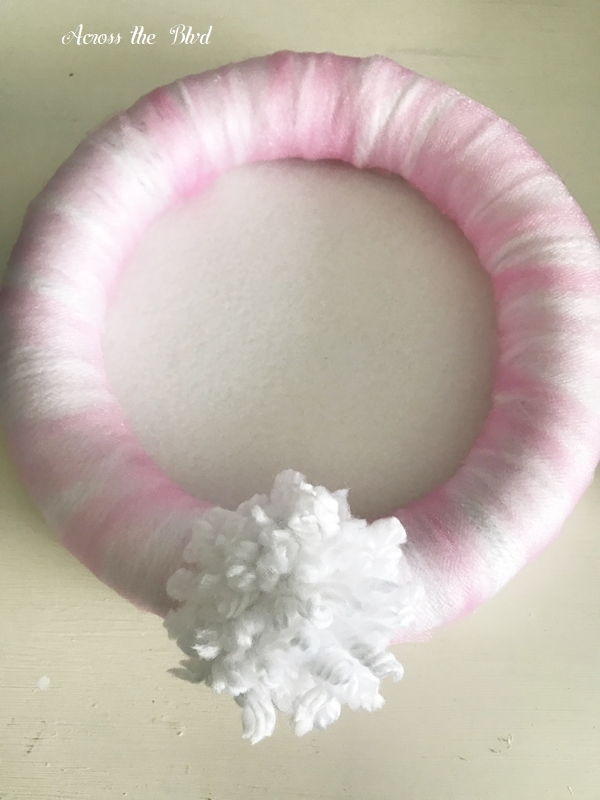 I wrapped the wreath form with white yarn and then topped it with some of the pink tulle. Both the yarn and the tulle are hot glued in place at the ends. 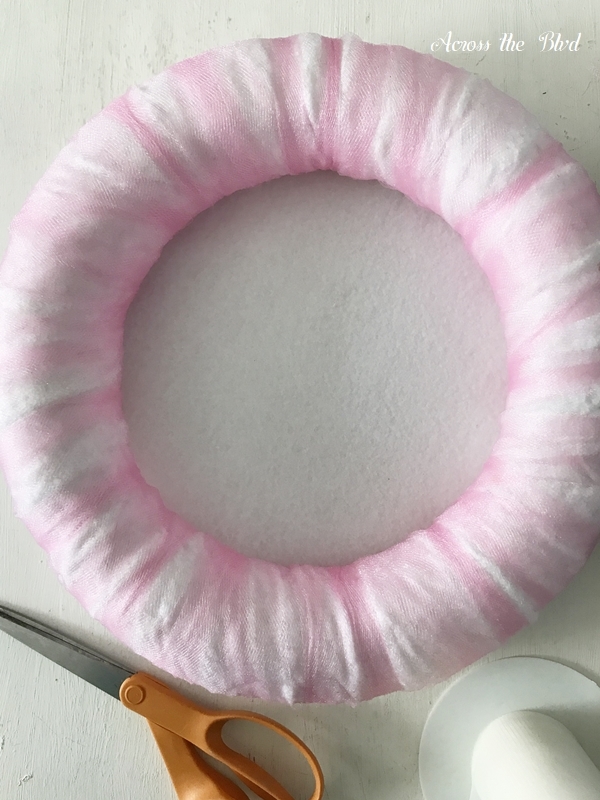 Using a larger wreath form that I had on hand, I repeated the yarn and tulle layers. 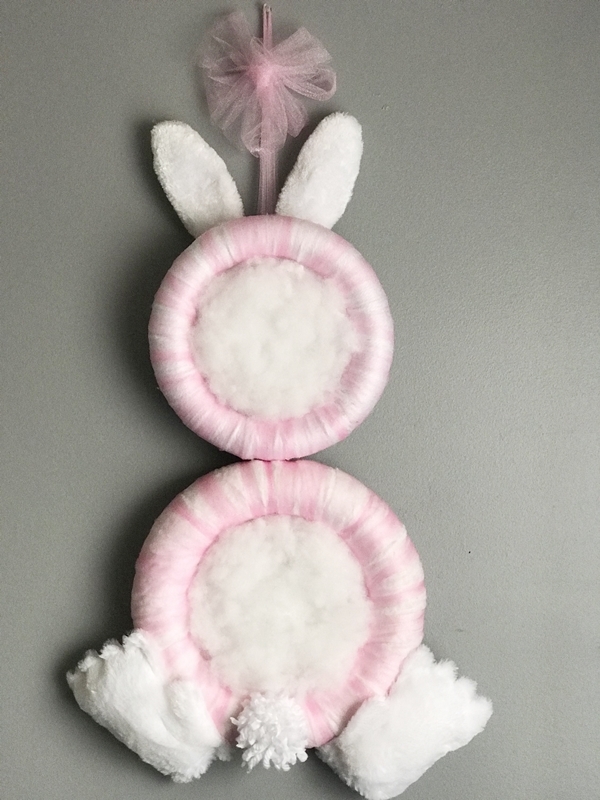 For the bottom wreath, I made a pom pom bunny tail and hot glued it in place. I used sheets of white felt as backing. The sheets are cut to fit and then pinned in place. I used two sheets to avoid being able to see the outline of the stick I used to hold the two wreath forms together. 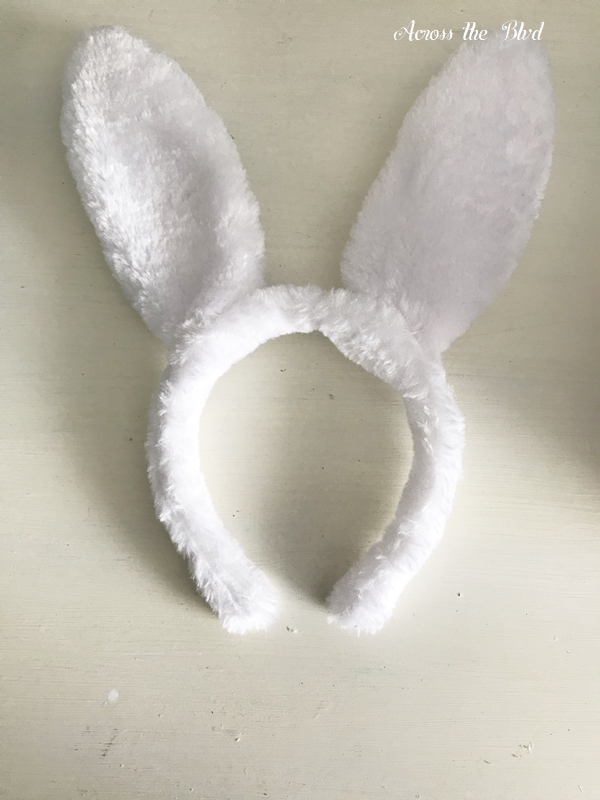 The bunny ears are from the deconstructed project I mentioned. Last year I used this for a tabletop bunny. 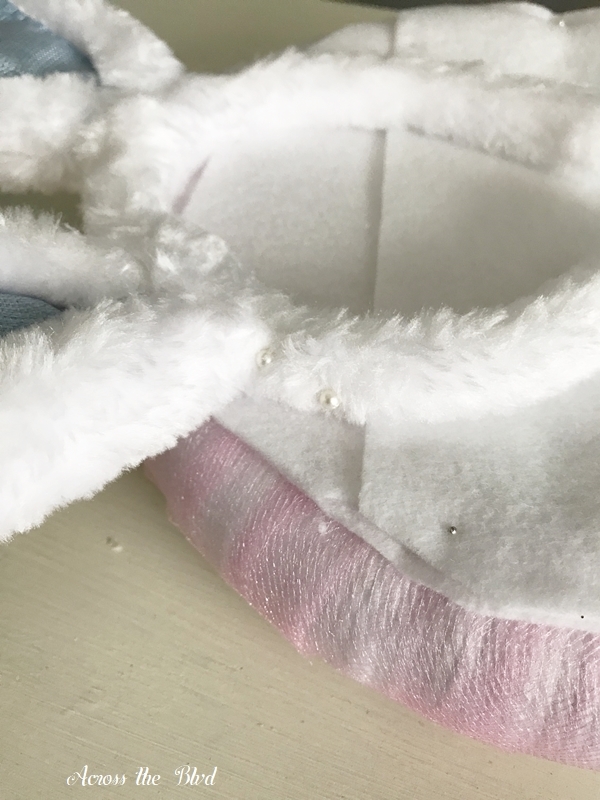 Since this bunny is white and pink, I didn’t want the blue on the ears to show. Also, since this is the backside of the bunny, the position of the ears worked out. I used pearl head pins to hold the head band in place. Sometimes, I look around for an item to use and don’t find exactly what I need. What I did find was a paint stirrer stick that was the right size to go over the two wreath forms. I hot glued the stirrer to both the top and bottom form. To finish it off, I covered it with a strip of white felt. 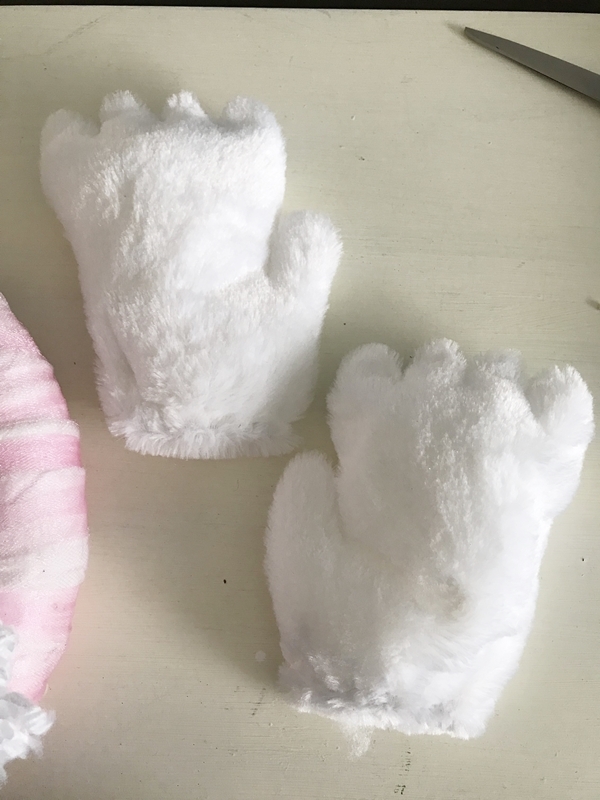 The feet came from the tabletop bunny that I deconstructed too. They are stuffed with poly-fill. Pearl head pins hold them in place. 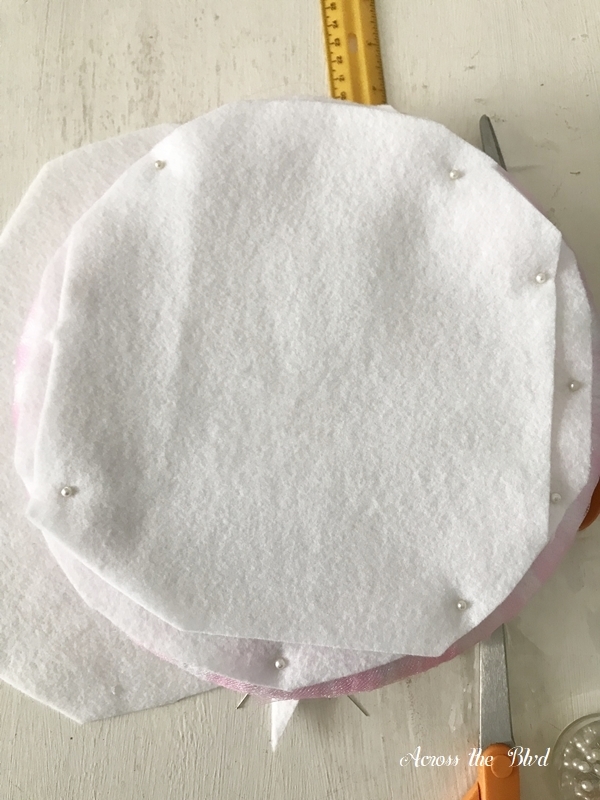 To cover the inner circles of the wreath forms, poly-fil in tucked all around. I added some hot glue to the felt before stuffing the poly-fil inside. I hot glued a loop of tulle to the back of the top wreath to use for hanging. 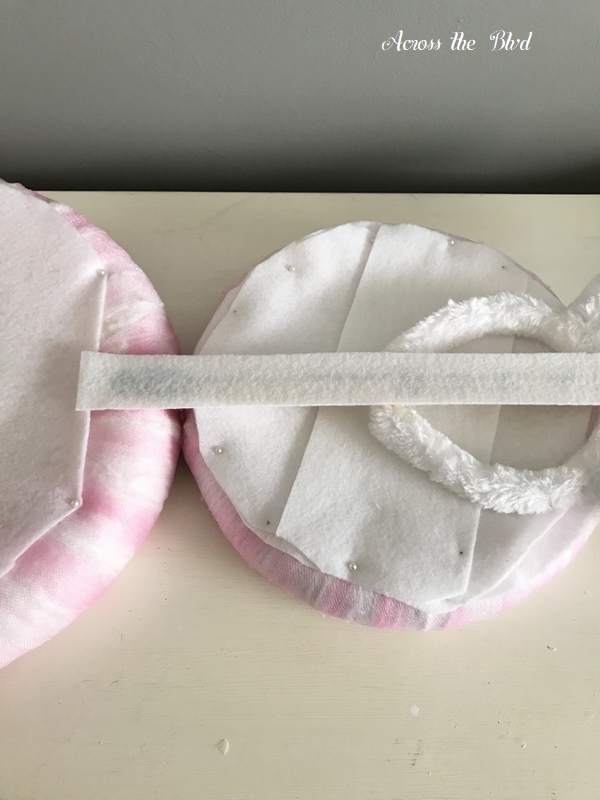 A double looped tulle bow is tied around that piece. 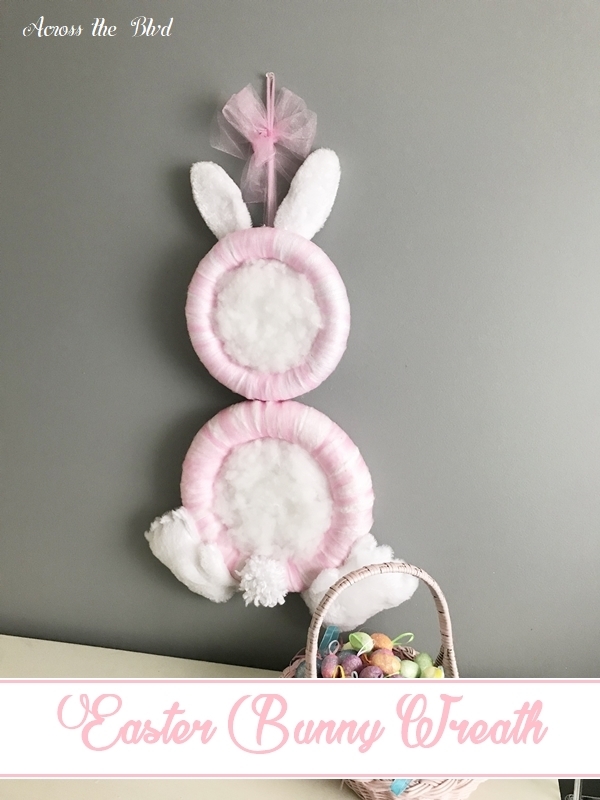 It’s a fun piece of Easter decor that can be used on a door or wall. I wouldn’t recommend using it on an exterior door unless the doorway is covered. I don’t think the poly-fil would hold up under rain. 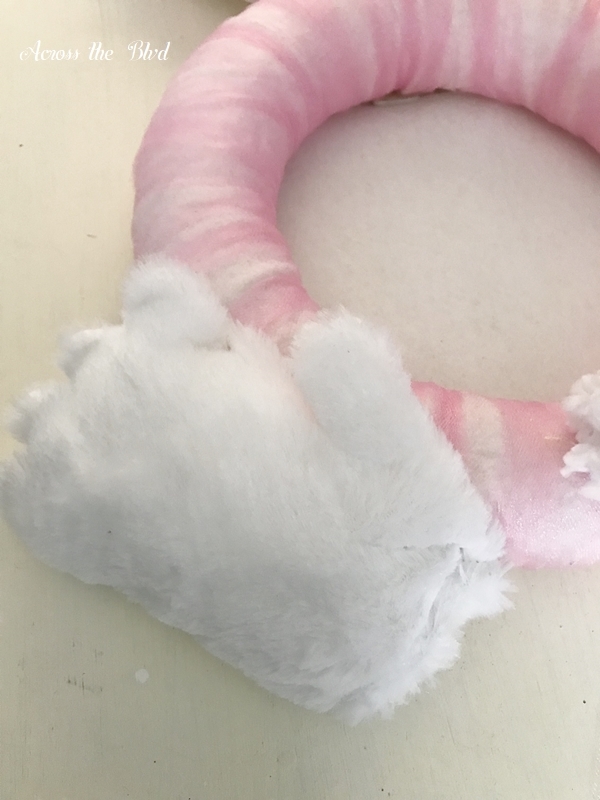 Beverly, This has got to be one of the most adorable bunny wreaths I’ve seen this season! I just love those bunny feet!! Unique idea to see to backside of the bunny hopping away. Great project refresh. Pinning and sharing! Thanks! It was fun to put together and I always like it when I can reuse items or give them a different look. Thanks so much for sharing, Laurie! Thanks, Michelle! 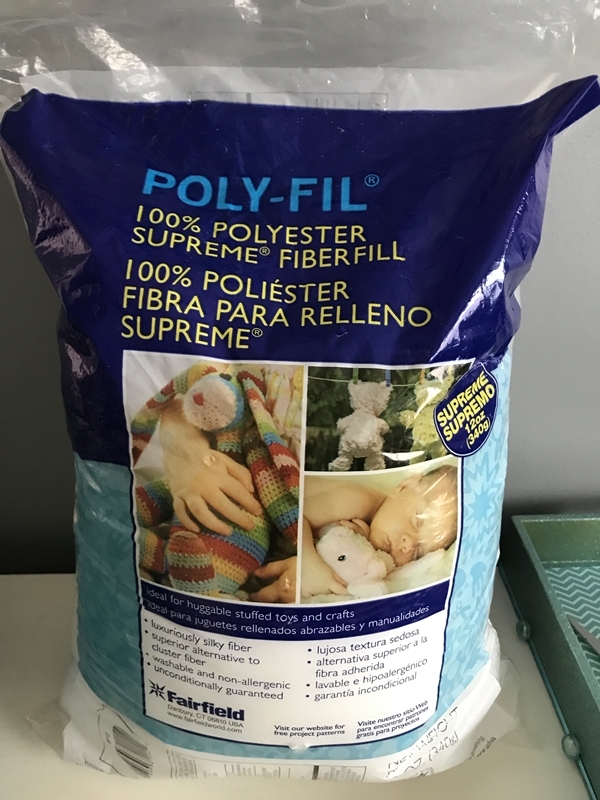 The poly-fil works great to get that fluffy look. Thats an adorable project. It made me smile. Thanks so much, Anna. It makes me smile, too. Tottally adorable! One of the cutestthings ivv seen on here, probably cuz its a fluffy bunny. Good job! I love the fluffy part of it, too! Thank you, Nancy! Oh dear, My comment posted to moderation before I was ready. Please feel free to delete the first one. The all caps problem fixed itself somehow. Anyway, I followed you from Julie’s Linky Party. Your darling bunny wreath is so sweet. Thank you for posting the tutorial too! Thank you, Gina. Sorry you had trouble posting a comment. I’m delighted you like the bunny wreath! That is adorable! 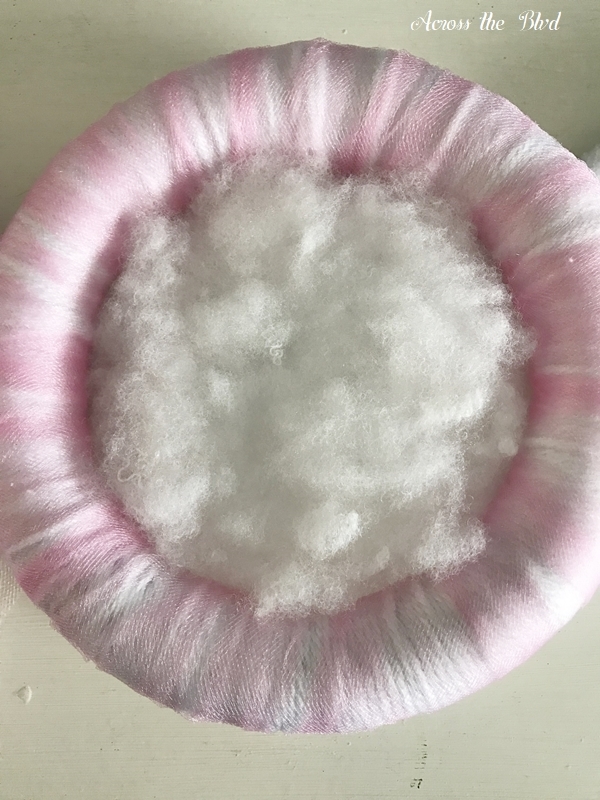 I love all the fuzzy white and pink too; we don’t have much pink around in our house. Pinned. I love the fuzzy part, too! Thank you, Joanne and thanks so much for pinning!